The Habitat Program is charged with protecting healthy and functional nearshore, estuarine, and river habitat, restoring those areas that are degraded, and doing research to understand the organisms and the land/water they occupy. The law recognizes the necessity of good habitat for the Tribe’s to exercise its Treaty Rights, yet we do not have jurisdiction over managing habitat off-reservation. The Habitat Program must work with those agencies that have jurisdiction (permitting authority). Primarily we work with NOAA Fisheries, U.S. 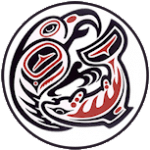 Fish and Wildlife Service, U.S. Forest Service, Washington Department of Fish and Wildlife, Washington Department of Ecology, Washington Department of Natural Resources, Clallam County, Jefferson County, City of Port Townsend, and City of Sequim. Each of these agencies or local governments has responsibility for a piece of the habitat pie, and we must work with all of them to ensure Treaty Resources are protected. Our activities can be grouped into four areas: Environmental Review, Research and Monitoring, Restoration, and Habitat Planning. The Forest and Fish Rules regulate timber harvesting on non-federal forestland in Washington State and are administered by the Washington Department of Natural Resources. Timber harvesting has both direct and indirect effects on the riparian ecosystems Salmonid fish species depend on. Tribes have been integral to the refinement of these state forest practice rules in order to protect and enhance treaty resources that could be impacted through timber harvest. The Jamestown Tribe remains engaged in the Forest and Fish process on a number of levels. Individual Forest Practice applications are reviewed within the Tribe’s primary management area and field research is conducted to determine effectiveness of the rule prescriptions. We participate as stakeholders in the Forest and Fish Adaptive Management Program to ensure interdisciplinary scientific research provides the feedback loop necessary for informed rule-making decisions at the policy level. We review many types of plans, from those that cover a large area (for example the Washington State Department of Natural Resources Habitat Conservation Plan), to those that are locally based (U.S. Forest Service Dosewallips River Road Washout, or the Army Corps of Engineers Dungeness Meadows Dike repair). Our goal is to prevent harm through whatever action is proposed. This is often easier said than done. Each agency and government has their own agenda for their project, and despite all the permit hoops its design may result in substantial degradation of Treaty Resources. We are able to better protect habitat when we give input at the start and throughout the process, rather than commenting on a finished product. The Dungeness River floodplain and riparian forest are rapidly being taken over by several prolific non-native species. These invasive plant species are out competing native flora that is the foundation of a healthy riverine ecosystem which tribal trust resources depend on. Resource agencies and conservation groups in Washington State have only recently recognized Knotweed and Buddleia as a significant threat to salmon habitat (e.g. : US Forest Service and The Nature Conservancy). Knotweed species rapidly replace native vegetation in disturbed areas such as river channel migration zones. Once there, it impairs riparian function, inhibits natural succession and development of new riparian forests, and reduces critical habitat for fish and wildlife by reducing the ecological services provided by native shrubs and trees. The problem expands rapidly, with increasing losses of functioning riparian habitat. Introduced knotweed has no natural predators or control agents and can reproduce vegetatively from root-stem (rhizome) fragments as small as 0.7g and can also re-sprout from the nodes. Flood events scour plants out of river bars and banks and then transport these fragments to new locations. There is growing evidence (North Puget Sound and Snohomish County) that the hybrid form (P. X bohemicum) is capable of producing viable seed. This is of particular concern in the Dungeness River, as the most prevalent knotweed species in this watershed appears to be the hybrid variety. Buddleia davidii, another escaped ornamental is rapidly dominating gravel bars, side channels and floodplain forests of the Dungeness. A strategic decision was made to begin control efforts with knotweed because it has so many dispersal mechanisms, it’s presently restricted to the lower eight miles of river, and has a demonstrated potential for exponential growth in adjacent watersheds. Using Survey Data to Prioritize Small Stream Restoration: A case study of Siebert Creek – As part of the Siebert Creek Watershed Assessment, a total census (100% survey) of large woody debris (LWD) and pool habitat was mapped from the limit of tidal influence upstream to the SR101 culverts (approx. RM 3). A riparian stand analysis was also conducted for the entire creek, including the two main tributary forks up to the Olympic National Park boundary. The physical habitat survey of LWD and pool habitat, along with the companion riparian stand analysis, was designed to inform restoration efforts by identifying areas of Siebert Creek that are critically low in favorable fish habitat features. Unfavorable in-stream habitat conditions (i.e., low number and quality of LWD and pools) when found to coincide along stream reaches where adjacent riparian forests are in an early seral stage and incapable of providing near term recruitment, can negatively affect multiple salmonid species at different life phases. Mapping current habitat conditions serves as a refinement of previous habitat work where representative reaches were sub-sampled. Combined with other elements of the watershed assessment, this method helped prioritize restoration efforts and resulted in an in-stream LWD jam placement project for the most degraded reach identified in the assessment. This project was accomplished in partnership with the Lower Elwha Klallam Tribe in the summer of 2004. During the 1990’s until present, we focused our research on gathering baseline information for the Dungeness River, our home watershed. We initiated several reviews of historical information. 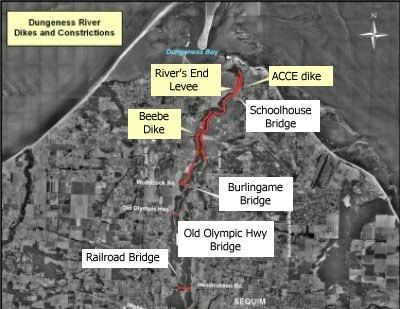 One was recently completed for the Dungeness estuary and nearshore (see “Historical Geomorphology and Ecology…”), and another is in process for the river corridor (Channel migration zone study). Along with the Bureau of Reclamation, we have studied how the river works in a physical sense, which is important to understand for restoration and protection (see for example “Physical Processes and Human Impacts…”). For example we know that gravel traps placed in the river in the 1990’s around Dungeness Meadows immediately caused the riverbed to lower and undoubtedly harmed salmon. This research has also showed us that the average size of gravel, especially upriver of Dungeness Meadows is too large for spawning salmon. Research on juvenile salmon use of side channels found that they are extremely important to the health of the river (see “The Evolving Dungeness River…” and “Salmon and Trout Life History”). Finally with our 13 years of chinook redd mapping (redds are places where eggs are laid), we understand where chinook spawn which helps protect those redds from disturbance. More recently, we have focused our research on river and estuary restoration and protection. We are studying different options for setting back the Army Corps dike in the lower 2.7 miles. We are planning for a large woody debris restoration project upstream and downstream of RR Bridge (see below). Along with our partner, Bureau of Reclamation, we recently completed a study looking at relationships between main river discharge and flow into side channels (Dungeness River In-Stream flow side channel study). And finally, our partners Bureau of Reclamation and Clallam County, completed a study of where the river has been located in the vicinity and downstream of Kinkade Island (Kinkade Island Geomorphic Study). The Dungeness is the home watershed for Jamestown S’Klallam Tribe. For it’s size, it was historically one of the most productive watersheds in terms of salmon, in Puget Sound. For example until the late 1970’s, this 260 square mile watershed accounted for approximately 5% of pink (humpies) production in Puget Sound. Chinook, summer and fall pink, summer and winter steelhead, summer and fall chum, coho, sea-run cutthroat, and bulltrout are the anadromous salmonids that call the Dungeness River home. Our restoration goal is to restore or rehabilitate salmon habitat so that salmon return at harvestable numbers. The lower 10 miles of the river (Dungeness valley) has been extensively diked or bank armored with rock. In reality, the river floodplain contains side channels that are critically important for salmon (see “The evolving Dungeness River…” and “Salmon and Trout Life History…”). Many, many studies have related the negative impacts of diking on salmon habitat. Some folks think that floods kill salmon, however salmon evolved to deal with floods (they hide in floodplain channels), and floods create extensive new habitat. The fact is too many people have built their houses too close to the Dungeness River. This puts constraints on river movement; new habitat is created through the channel physically changing location and through the input of large wood into the river. We cannot go back in time. What we can do is work to change some of the current constraints, and work within others that we cannot change. The highest priority for our restoration strategy is the river mouth, estuary and lower 2.7 miles. This habitat is used by all salmon at many different stages of their life and historically was diverse and productive (see “recommended restoration projects for the Dungeness River”). We are also planning to install up to 11 large logjams upstream and downstream of the RR Bridge. These logjams will be hardpoints in a very active channel. Installation is slated for the summer of 2007. Eventually islands of mature trees will grow up around and downstream of the logjams. Currently the river has a great deal of energy, gravel of suitable size for spawning is flushed away. We are designing this project and will go out for permitting soon. Of the two invasive plant assemblages currently established in the Dungeness River, Buddleia is the more prevalent and will require more labor-intensive control methods. In some cases, Buddleia is the dominant vegetation on entire gravel bars and will require a comprehensive and specific strategy to bring under control. Lesson’s learned from other biological invasions such as Spartina (cordgrass invasion of Willapa Bay) indicate that without aggressive and immediate control these invasive plant assemblages can dramatically alter ecosystem processes and physical habitat characteristics, and will ultimately undermine conservation and restoration achievements aimed at sustaining native species already at critical population levels. In 2004, a database was constructed to store survey information, an extensive data dictionary was loaded onto Trimble hand-held GPS units enabling surveyors to catalog detailed information and specific characteristics important to monitoring knotweed species. Current aerial photos were scanned to provide the background for the project’s Geographic Information System (GIS) coverage and maps. A crew composed of tribal members and local college students were hired and trained by the project coordinator in the stem-injection method and in the safe and competent operation of survey and treatment equipment. Incorporating GIS/GPS into the project resulted in a comprehensive spatial data set with embedded information specific to each mapped occurrence. This dataset can be queried and analyzed to provide summary statistics. The 2005 survey and treatment effort showed a 50% reduction in knotweed stem density over 2004’s inventory. Project monitoring is ongoing. Our monitoring plans are: “Phase I monitoring plan…” and “Estuary monitoring plan.” Two tribal biologists and two technicians spend a significant amount of time monitoring the project. Why? Six million dollars of public and tribal funds were spent on the project. We must learn what worked and what did not and the reasons for success and failure. We also need to know how salmon and wildlife respond to different parts of the project to improve our efforts when we go to another site. The Jimmycomelately Creek project was supposed to be a short warm-up and learning experience for our restoration efforts on the Dungeness River. They share similar problems. Loss of floodplain through diking or channel straightening, seaward migration of the river mouth through due to estuary diking, and crashing salmon stocks. We planned for a year or so of design and two years of construction. The reality was three years of planning and four years (summers) of construction. At its height, the Jimmycomelately project was one of the largest and most complex restoration projects in Puget Sound. Besides the Jimmycomelately Creek, we also restored an old logyard and another creek, Dean Creek. Why restore this small creek? The project cost roughly $6 million including construction of the Hwy 101 bridge, property acquisition, and restoration. We excavated roughly 210,000 cu. yds. of dirt, moved and restored 3/4 mile of two creek channels, and recovered almost 20 acres of saltmarsh. Compare this to a road resurfacing and main street improvement project in Sequim that cost $7 million. The restoration project will be around in perpetuity, the resurfacing project will last 10 years or so. Restoration is an investment in our children, wildlife, and our food supply. The problems at Jimmycomelately Creek are found in watersheds and estuaries throughout Puget Sound. We hope this will be a model for restoration elsewhere, which is why we have concentrated on writing project reports, guiding fieldtrips, and giving presentations. This project was successfully completed due to its many partners and funding agencies. Along with Jamestown S’Klallam Tribe, Clallam County, Clallam Conservation District, Washington Department of Fish and Wildlife, Washington Department of Transportation, Environmental Protection Agency, and local landowners were the major partners that planned and implemented the project. Funding came from 29 sources. It was a community project and we are thankful for everyone’s efforts. Dungeness Shared Strategy – Jamestown S’Klallam Tribe has been an integral member of the Dungeness salmon recovery planning team. In 2004 and 2005 there was an intensive effort to identify the Dungeness Basin’s salmon recovery needs and strategy. This work was then submitted to the Shared Strategy Development Committee to be incorporated into the salmon recovery plan for Puget Sound. The proposed Puget Sound Salmon Recovery Plan for Puget Sound Chinook presented by NOAA Fisheries in December 2005 includes the local team’s work in its entirety. Copies of the Dungeness Basin salmon recovery planning notebook are available through Clallam County, or on-line at the Shared Strategy for Puget Sound website. Dungeness River Restoration Workgroup— Jamestown S’Klallam Tribe participates on a subcommittee of the Dungeness River Management Team (DRMT) called the River Restoration Work Group. This group is made up of biologists and planners, with landowner representation as well, and it serves as a technical advisory group to the DRMT as needed. This group assists with defining current habitat conditions, restoration needs, and prioritizing projects.